Isn’t there a line about finding heroes in the most unlikely places? This is the setting of Daeng Abu’s and his wife Daeng Maida’s inspirational story: a desert island off the coast of Sulawesi in Indonesia, disabilities in Abu being blind and facing leprosy, their days spent raising sea turtles and speaking against the cyanide and dynamite fishing that is devastating Indonesia’s reef. 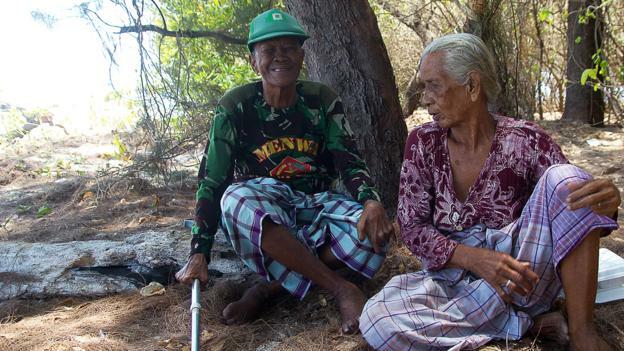 Neither knows how old they were when they entered their arranged marriage on nearby Pulau Pala (Nutmeg Island) – they currently believe they’re in their 80s – but Abu thinks he was older than 20 and Maida remembers it was the dry season. Her uncle fired three shots in the air; she walked over to his family’s home; Abu built a shack from bamboo and palm leaf; and married life began. Little did they know at the time – the couple was bound to become a rather unlikely pair of environmental activists. As the couple settled into marriage, Abu free-dove to depths of 25m or more for giant clams and abalone, embarking on weeklong fishing trips around the islands. Maida kept their house, cooked and wove. Wet season turned to dry season, and dry to wet. Sometimes they ate fish, sometimes only rice. And Maida bore six children; five died of shaking sickness before the age of one. In the dark of night, Abu set out for the city, Makassar, paddling and sailing for 12 long hours. Many times, over many years, he made this journey. The family always prioritised medicine over food. While speaking with me, Abu scraped his long, black thumbnail down his forearm, then again across a thigh, recalling the day the “big doctor” tested him for feeling and found he’d lost sensation in his limbs. When Abu told Maida he had kusta, the local term for leprosy, she wept. If Abu couldn’t dive, or at least catch fish, the couple would not eat. Soon after, in 1972, the head of their district asked for volunteers to live and raise turtles on Cengkeh, about an hour by sailboat from Pala. Nobody wanted to go. But Abu felt a desert island would be the perfect spot to escape both social stigma and the risk of infecting others as his disease followed its disfiguring course. A turtle hatchery was work the pair of them could do, and the government stipend would keep them when he became too sick to fish. BBC Travel brings you the complete story.